Weather permitting, the orbiting objectsshould be visible to the naked eye throughout the United States and Canada,according to SpaceWeather.com. It's a special opportunity to see the twolargest man-made objects in the sky at once. 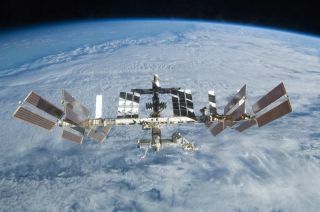 Atlantis undockedfrom the space station early Wednesday, ending a week-long stay to supplythe outpost with spare parts. The shuttle is scheduled to land at Kennedy SpaceCenter in Cape Canaveral, Fla. on Friday morning at 9:44 a.m. EST (1444 GMT). Seeing a satellite from Earth isn't that rare: The myriadcommunications satellites flying around Earth regularly appear at night asstars that look to be transiting across the heavens. But the shuttle andstation are both larger than any other vehicle in orbit, and should appear muchbrighter than the average satellite. On a good night, the station approaches magnitude -5 inbrightness, which rivals the planet Venus and is more than 25times brighter than Sirius, the brightest star in the night sky.